Ham - Full Back Leg / Picnic Cut (Front Leg) - uncured. 1. Mix your Misty Gully Maple Ham cure with water to make the brine. You need approximately 130g of cure per Litre of water. You need enough brine to completely submerge your ham in your container / tub. 2. Injecting your cure - use your injector to inject your ham with cure/brine as deeply as possible. For a proper cure, you need to inject the equivalent of 25% of the weight of the ham. Eg. If your ham weighs 4kg, you need to inject it with 1 litre of cure/brine. Make sure you get right along the bone. 3. Completely submerge your ham in the brine, then place it in the fridge to cure. How long you leave it to cure in te fridge will be determined by a) how large your cut of meat is and b) how salty you like your ham. For a rough guide, cure your ham for 24 hours per half kg. So for that 4kg ham, leave it in the fridge to cure for 8 days. Turn every 24 hours. That said, 10 days is usually more than sufficient for any full leg of ham. 5. Put back in the fridge on a plate / rack uncovered for 24 hours. This is where the ham will develop a 'skin' or pellicle, which will allow it to absorb more smoke and other flavours when cooking. 1. Pre-heat your oven or smoker to 120°C. You can cook it slower or faster depending on your preference, but we'd suggest you stick within a range of 100-140°C. 2. If you're using a smoker, we'd suggest Maple, Apple, Cherry or Peach Chips. Try pre-soaking them in apple cider or sherry for extra aroma and flavour complexity. 3. If you're using an oven - spray your Ham with Misty Gully Liquid Smoke, season, and cook. 4. Test your internal temperature constantly. Your ham is ready when it is 68°C throughout internally. 5. Allow to cool for 2 hours. 6. Store wrapped in a tea towel or Ham Bag in the fridge for up to 2 weeks. 1. In a medium saucepan heat brown sugar, orange juice, zest, a tbsp of cloves and the mustard powder. Allow to simmer until thick and syrupy. 2. Peel the skin off the ham being careful to leave as much fat on the ham as possible. Score the fat in a diamond criss-cross pattern (about an inch distance between each score). Cut maraschino cherries in half and pierce through with a long stemmed clove into each node in the criss-cross pattern. 3. Preheat oven or smoker to 175°C, glaze the ham and begin cooking. Baste every 20-30 min. 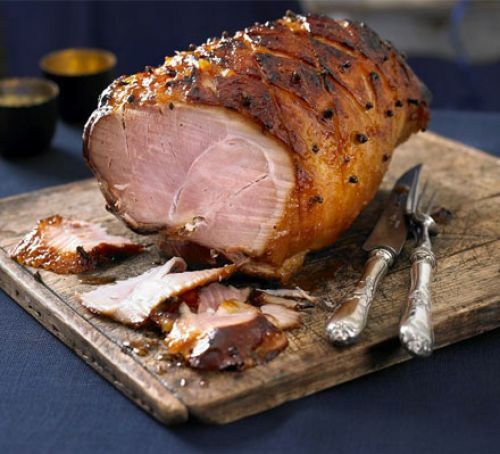 Cook for approximately 90 minutes, or until the Ham reaches an internal temperature of 68°C. 4. Carve and serve Hot!